An upcoming runoff for Brookhaven’s Gold Dome seat between Taylor Bennett and J. Max Davis carries statewide implications. Democratic candidate Taylor Bennett, a former Georgia Tech quarterback and now an attorney, could give the feeble Georgia Democrats a much-needed boost. Three months ago, Gov. Nathan Deal appointed state Rep. Mike Jacobs, R-Brookhaven, to become a DeKalb County judge. Amid a string of unlikely events, which included the death of state Rep. Harry Geisinger, R-Roswell, and the abrupt resignation of state Rep. Tyrone Brooks, D-Atlanta, the fight to become Brookhaven’s next legislator turned into more than just a local race. It’s now one that could end the GOP supermajority that has rendered Democratic votes futile. On August 11, Brookhaven voters will decide in a special election runoff who will replace Jacobs. Three attorneys—Democrat Taylor Bennett, Republican Catherine Bernard, and Libertarian Loren Collins—and former Brookhaven Mayor J. Max Davis entered the race. In a Republican-leaning district, Bennett emerged as the top vote getter in the special election. But since no candidate received more than 50 percent of the vote, Bennett and Davis moved on to the heated runoff. Bennett, who played quarterback at Georgia Tech and professionally in Europe, works as a lawyer representing employees in discrimination lawsuits. 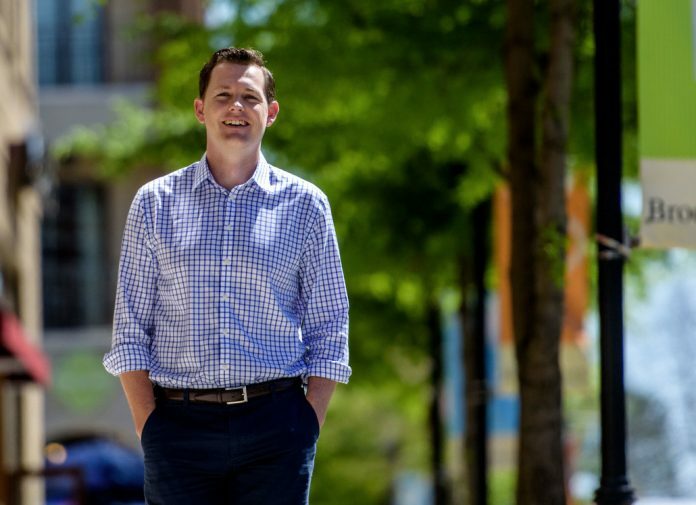 He decided to run for Jacobs’ seat after watching the Brookhaven representative vote against his party members to table the “religious freedom” bill, a measure that could allow business owners to deny service to LGBT people, during a House judiciary committee last March. Bennett, whose mother is openly gay, wanted to run to ensure further attempts to pass a “religious freedom” bill would be defeated. State Sen. Josh McKoon, R-Columbus, has already stated that he will bring back his legislation for the third consecutive year in 2016. If elected, Bennett also wants to look at potentially ending some corporate tax credits to free up cash for schools. He also says lawmakers should be supportive of MARTA’s $8 billion transit expansion plan that’s expected to be a major issue discussed during the 2016 legislative session. Davis—who declined an interview to discuss his candidacy, after spending several minutes on the phone inquiring about the article’s intent—has run a campaign that calls for tax cuts and greater investment in the region’s roads and transit. He’s also billed himself as a proponent of reform to both the state’s ethics laws and DeKalb County’s dysfunctional government. Despite Bennett’s surprising finish as the top vote-getter (who received some help of Detroit Lions wide receiver Calvin Johnson Jr., his former college roommate), Republican voters previously split between Bernard and Davis are expected to consolidate around the former Brookhaven mayor. That could spell problems for Bennett in a district that has had Republican representation since 2007. He is also now facing an ethics complaint for failing to file his personal financial disclosure before a deadline—something Bennett says he immediately resolved once he became aware of the missed deadline. But there’s an opening for Bennett amid a sexual harassment accusation against Davis over allegedly spraying a women’s buttocks with an aerosol can filled with air freshener. The former mayor has denied wrongdoing, though others have cried foul over a coverup of the incident. Bennett, who coincidentally represents workers involved in sexual harassment cases, declined to comment on the Davis allegation but used it to call for stronger ethics laws. Should Bennett beat Davis, Georgia House Republicans would lose their effective supermajority (state Rep. Rusty Kidd, I-Milledgeville, tends to vote with the GOP). Why’s that important? Charles Bullock, political science professor at the University of Georgia, says Democratic lawmakers would be able to block GOP-backed constitutional amendments that now sail past them untouched. If that happens, he says, House Minority Leader Stacey Abrams, D-Atlanta, would need to unify her entire caucus to make the 60-representative block work to her party’s advantage. House Republicans would still have the upper hand on many votes during the 2016 legislative session. Yet Taylor’s victory would represent an important victory not just in Brookhaven, but across the entire state.